The male Purple Martin in uniformly blue-black above and below and is North Americas largest swallow. 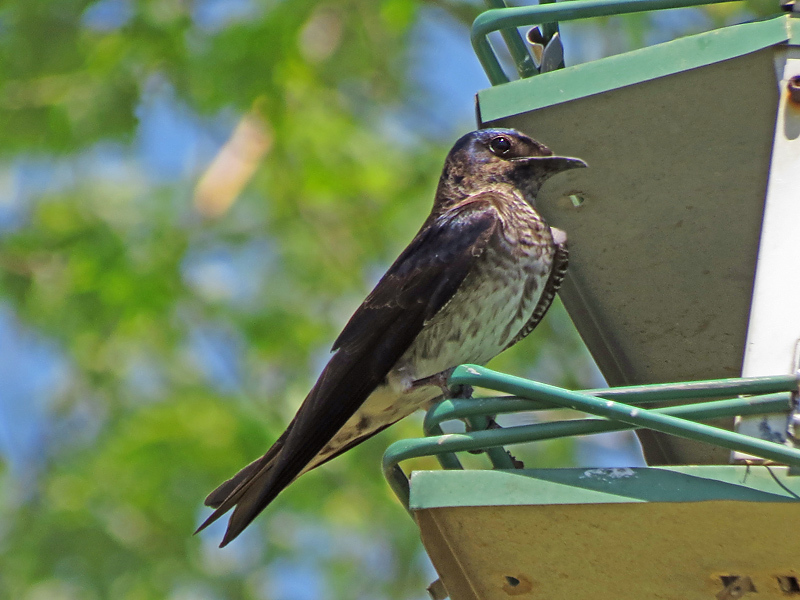 The female Purple Martin is brownish-gray above, a light belly and throat, and with a faint collar. It has a range from southern Canada to northern Mexico. It has a habitat of towns, farms, semi-open country, mountain forest edges near water, and lowland desert with giant saguaro cactus. 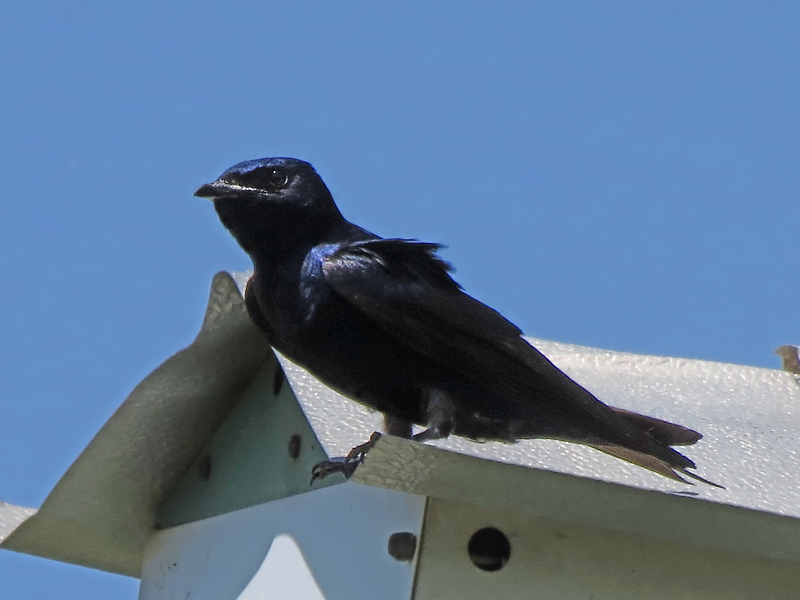 Almost all Purple Martins nest in birdhouses put up especially for them. 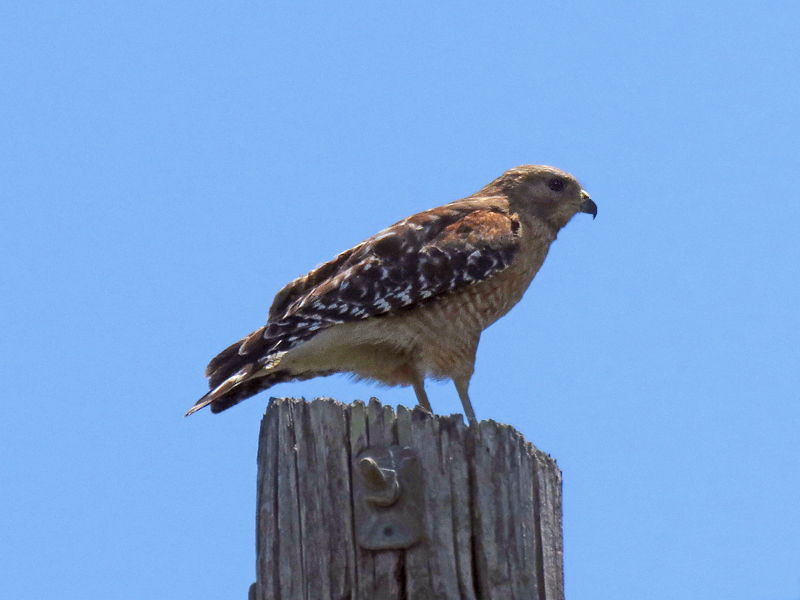 It feeds on a wide variety of flying insects: wasps, flying ants, bees, beetles, moths, and butterfly s.
This Red-Shouldered Hawk was photographed in Baxter Springs, Kansas while hunting Starlings-they ganged up on him and gave chase. The Red-Shouldered Hawk has a dark patched upper, heavy dark bands on both sides of the tail, rufous shoulders, and pale robin-red underparts. This is a forest buteo recognized by its ample tail and broad wings. It has a range from southeastern Canada, the eastern half of the United States, and California. It has a habitat of woodlands, wooded rivers, and timbered swamps. It feeds on small mammals, amphibians, reptiles, and birds. It usually hunts by watching from a perch.